Life is somewhere between hard and heartbreak for the majority-Latino tenants remaining in The Melrose apartments, where residents of 40 of its 72 units are facing an eviction deadline of Feb. 1. This is the latest, and probably the final, wave of no-cause evictions at the apartment complex, where tenant rights have gone head-to-head against its ownership for the past year. Previous eviction notices began early last year but were later rescinded following a public outcry. Tenants who remained in their units then received a rent increase Oct. 1, followed by a new wave of 90-day evictions issued Nov. 1. The evictions are the subject of a lawsuit by the Oregon Law Center representing 19 tenants who say their ouster is retaliation for complaining about the condition of the units. The tenants had asked that the rent increase be rescinded until repairs were made to the units. The no-cause evictions arrived soon after. And barring any change in plans by the building’s owner, the largely Latino community will be dispersed from the St. Johns complex, which is being updated with better amenities and higher rents. José “Chepe” Vierra, a tenant of The Melrose, said “the situation is critical” for his family. He said he can’t find affordable rentals near his current home and his family needs more time. Vierra is 63 years old, and spoke in Spanish as he stood in an apartment with rotting living room carpet and a dilapidated kitchen floor. Another tenant, who declined to give her name but will go by Maria for this story, was thankful her family found a new apartment just days before it was time to vacate. Still, she said, standing in her living room and rocking a 7-month-old child, the move is a hardship for her family. The initial eviction notices went out soon after the sale of the property, then known as Titan Manor, in October 2016, Willamette Week reported. Then Oregon Public Broadcasting looked into the new ownership group and found links to T. Gary Rogers, a Californian who’s been CEO of Dreyer’s Grand Ice Cream, chairman of Levi Strauss & Co. and chairman of the San Francisco Federal Reserve Bank. The property is being managed by Avenue 5 Residential LLC. Staff at the Community Alliance of Tenants have been working with residents in the 45-year-old North Fessenden Street complex since 2014. But it was after the current owners began issuing eviction notices that it become a symbol for the city’s affordable-housing crisis. The building was purchased by a group of limited liability companies for $8.3 million and renamed The Melrose. There’s no evidence the owners and managers intend to discriminate, but the waves of evictions at The Melrose fall predominately on the shoulders of the Latino community that calls the building home. The owners maintain that the building needs repairs that can’t occur while residents stay in their units, necessitating the evictions. Lavey said that to date, 30 affected residents have received $4,000 each in relocation assistance from the apartment owners and have been offered $200 for moving assistance. However the lawsuit notes four Melrose eviction recipients were tenants whose apartments already had been substantially renovated or who had already been relocated into newly renovated apartments in the past year. After complaints from tenants, city inspectors found 490 housing code violations at the former Titan Manor, the most that any single property in Portland has ever received, according to CAT. According to the lawsuit, code violations were rampant under the previous owner. Numerous inspections by the Bureau of Development Services dating back to June 2015 record multiple, repeated violations and a failure to correct the violations. It also found new violations last year related to electrical, plumbing and mechanical repair work conducted without proper permits and inspections. Tenants at The Melrose apartments in Portland’s St. Johns neighborhood reported mold and mildew throughout their units, among other serious concerns. 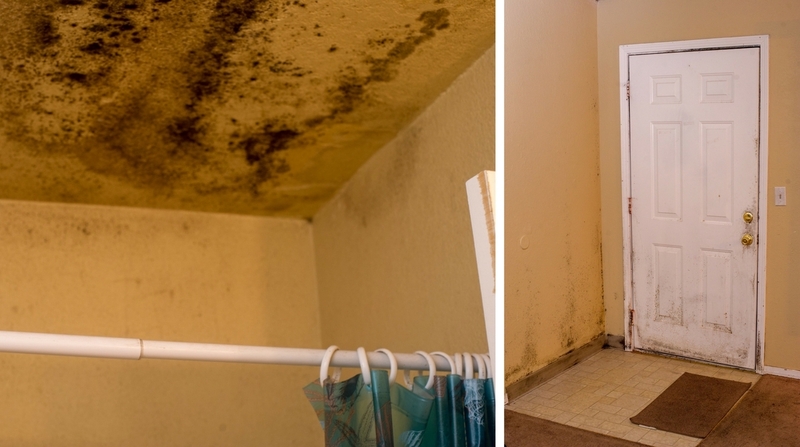 Tenants reported mold and mildew throughout their units, toilet and bathtubs that were not secured or leaked, rodent, cockroach and bedbug infestations, leaking or malfunctioning appliances and severe dilapidation. Lavey and an attorney for the Oregon Law Center declined to discuss the lawsuit, which seeks approximately $4,000 to $5,000 for each of its 19 residents. Maria and José Vierra aren’t in the lawsuit or working with CAT, but they’re part of what appears to be a majority of tenants who are Latino. More than half of the 19 plaintiffs in the lawsuit have Latino surnames. A school secretary at the majority-Latino school James John Elementary, Angela Diaz-Deleon, said she was aware of 20 students living at Titan Manor/The Melrose whose families got eviction notices last year – all of whom were Latino. Vierra and his wife, Julia Morales, pay $900 for the dilapidated two-bedroom apartment they have lived in for 18 years. They said The Melrose’s Seattle-based management company, Avenue 5 Residential LLC, won’t accept their application to move to a vacant renovated unit at a higher price point. Vierra said managers haven’t responded to calls from other property managers calling for a reference from those who found other places to go, like his nephew, who lives in a separate unit. “They don’t answer the phone for references,” Morales said. Policy and Organizing Director Pamela Phan of CAT said she’s heard similar complaints from other residents trying to move, though lately managers “have made some effort” to return calls for references. As of press time, Avenue 5 Resident LLC had not replied to an inquiry Street Roots sent to its media email. One thing that no one disputes is that the owners are intent on fixing up the property after years of neglect. On Jan. 18, Sherwin-Williams vans decorated the parking lot, maintenance workers were busy, and paint fumes filled the air. New design elements graced exterior walls. “We believe strongly that we’re doing everything possible to make The Melrose a better place for the residents,” Lavey said. CAT’s Phan said the focus is on the building, not its residents. “I’ve spoken to the owner several times, also site manager and leasing manager, and it’s pretty consistent that folks see (them) as units that provide income, and they definitely do not see the residents who live there,” she said. Not all facing eviction are people of color. Those who aren’t, however, may be vulnerable in other ways. Sam, 62, struggled to lift groceries up weather-beaten stairs badly in need of a paint job to his second-story home. “Everybody’s getting evicted, far as I know,” Sam said, declining to give a last name. He said he’s looking for a new place, but his Social Security income doesn’t go far enough for most potential landlords. His monthly Social Security income has only gone up about $20 each year, he said. Housing prices, of course, are far outstripping that rate: $1,330 was the median rent for a one-bedroom in December for the Portland area, according to the real estate website Zumper. Rent Jungle averaged Portland-area one-bedrooms at $1,471 and two-bedrooms at $1,776. “You know how it is,” Sam said as he crossed the threshold of his apartment. Some of those who live in the building are undocumented immigrants, including Maria. Their lack of legal documentation can present a significant additional barrier to finding a new apartment. The language and legal barriers also often lead undocumented families to shun making connections with advocates or unknown organizations. Maria said food stamps are the only help her family receives. Undocumented immigrants qualify for food stamps only if they have a child who was born in the United States. Her family is luckier than Sam’s or José Vierra’s: They already know where they’re headed, and their new apartment is nearby. Maria’s kindergartner won’t have to switch schools. But that doesn’t make it easy. Previous Previous post: 3 of 4 Hate Groups in Portland Are Black? How Is That Possible?